My Tribe Game Review - Download and Play Free Version! Nearly infinite island locations to choose from. Adjustable the game speed to suit your needs. Three mysteries to solve on each island. Advance far enough to build a Great Ark and leave your island. Small number of mysteries to solve. Aspects like clothes don't serve any purpose. There is a legend of a small but beautiful city where the people were happy and safe. But they were adventurers at heart and loved to explore the limitless ocean. One crew set out and found a vast plethora of unexplored islands, but their joy was short lived because on the twelfth day of their journey a mighty storm arose and smashed their small vessel. They now find themselves stranded on an unfamiliar island. Help this determined crew set out and build a new home for themselves. In My Tribe, it is your job to build up a prosperous village and unlock the various mysteries that each island holds. In order to do this, you have to assign your villagers to certain tasks such as collecting food, firewood, and rocks so that you can build new buildings or conduct research to obtain important items in fields like agriculture, arts, and construction. Your villagers gain experience and can specialize in certain tasks as they grow and age. You can also advance your village by collecting fallen stardust and moon dust or various random boxes which wash ashore. Be forewarned though, not all the boxes are beneficial to the tribe! My Tribe presents an interesting and enjoyable tribe simulation which anyone can easily pick up and savor. Additionally, a compelling aspect of the game is that events continue on the island even when you're not playing. With thousands of island layouts to choose from, each with three different mysteries, there is a ton of variety and challenges which you can face, as well as a huge replay factor. 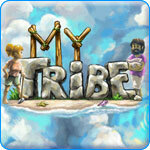 So, if you like engaging gameplay and tribe simulation games, download My Tribe today! 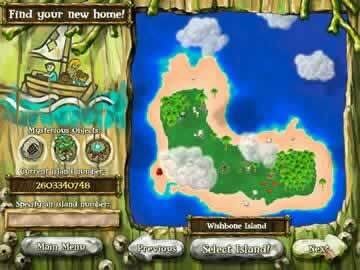 In My Tribe you control the lives of your villagers so that they can create an island home that will sustain them. You have to set people to tasks that will help the tribe get food, resources and future generations to continue the work of your initial characters. Along the way there are mysteries to solve and lots of potion combinations to discover and figure out what they do. My Tribe has great true real time people sim action. Your group of villagers come from a happy prosperous city, but they loved to explore. They set out and a huge storm smashed their ship and left them stranded on your island. You can either choose to begin with a brief tutorial that will give you the finer points of the game or if you are familiar with the game you can leave it out. There are many resources you will need to collect: wood, stone and food are the three most important and are vital to survival. Other things like mushrooms, stardust and moondust help you, but aren't necessary. Building housing, science facilities and storage is just the beginning. Once you have set up all the necessities, you can begin adding extras and solving mysteries. 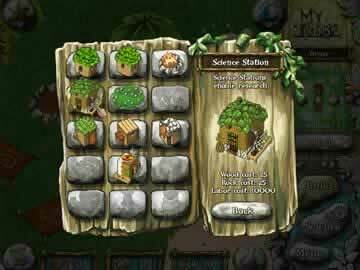 Villagers can be set to tasks for gathering construction or science. When a villager works on a particular task they gain skill, the more skill they have at a task the faster they work. Gaining skill can also help you solve mysteries. You also need to keep the population of your town up so that when the first generation becomes too old or dies there will be people to replace them. On each island there are three mysteries to solve. Solving mysteries will benefit your village. The Celestial Starstone will increase the amount of stardust that falls on your island. This is a true real time game, so when you turn it off things keep happening. The next time you turn the game on your people will be older and have progressed . This makes the game very interesting because you never know what to expect. The graphics in My Tribe are on par with other similar games in the genre. Everything is in 2D and has pretty basic detail and coloring. For sound there is constant background music as well as various sound effects that let you know of events. An example would be when stardust falls you hear a wind chime type sound. Overall the graphics aren't superb, but they don't detract from the game either. The game does have a few drawbacks that will limit the replayability. On each island there are three mysteries to solve, but there are only eight mysteries to solve total in the game. Once you have them figured out there is no more challenge. While new clothes provide you something to shoot for, they don't provide any use to your villagers. My Tribe is a great true real time sim game. With a never ending supply of new locations to build your tribe you won't soon run out of things to do. Even with limited mysteries to solve there is plenty of other goals to shoot for. Simple controls and the family friendly theme make this a great game for everyone. Sim fans and everyone else will enjoy this great game. Catch a glimpse of some of the actions you can make your villagers do on the island, such as fish, collect star dust, or create families.